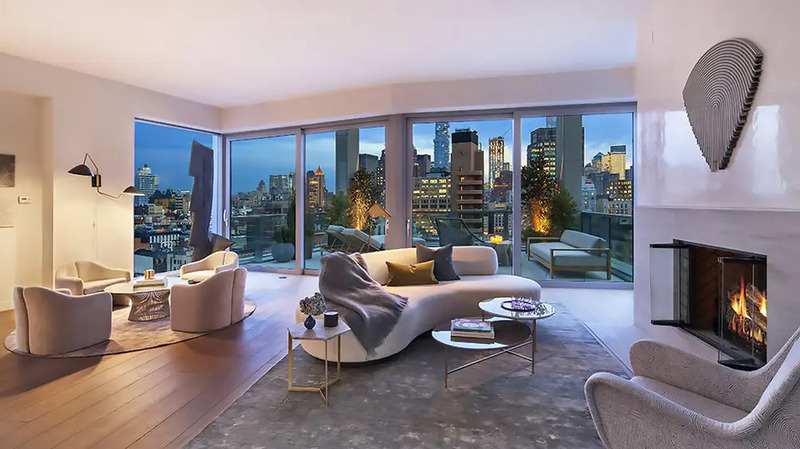 A sprawling triplex penthouse at One Vandam, or 180 Avenue of Americas, is once again back on the market after being listed for a jaw-dropping $28 million back in 2014 with no dibs. The current listing for this impressive 5,286-square-foot home is hoping to sell for $25 million. 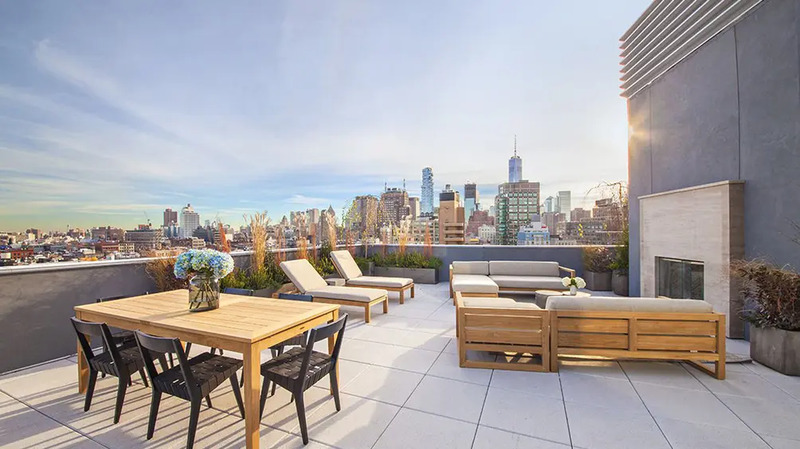 The triplex penthouse averages $4,729 per square foot and is comprised of 4 bedrooms, 5.5 baths, three terraces totaling 1,996 square feet, and a rooftop “spa” terrace. 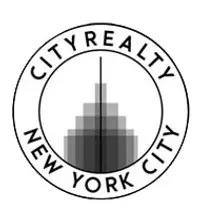 One Vandam is a 2015 constructed boutique condo located in the heart of Soho. 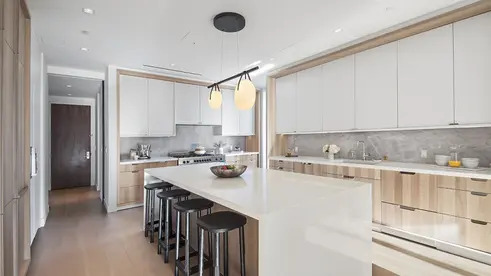 The luxury, white-glove building has 25 apartments spread over 14 floors and was developed by Quinlan Development Group and Tavros Development Partners, a company whose primary focus is on ground-up development. With sought-after BKSK Architects behind the design and interiors by Studio DB, there are hand-crafted details and finishes created especially for One Vandam, making this unique and sumptuous building entirely bespoke and modernist in vision. 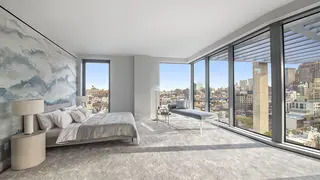 Located at the intersection of Sixth Avenue and Spring Street and adjacent to the West Village and Tribeca, this limestone-and-glass condo is not only remarkable for its unique wedge shape, but also for the way it rises high above its neighbors, which are mainly low-slung buildings and lofts. 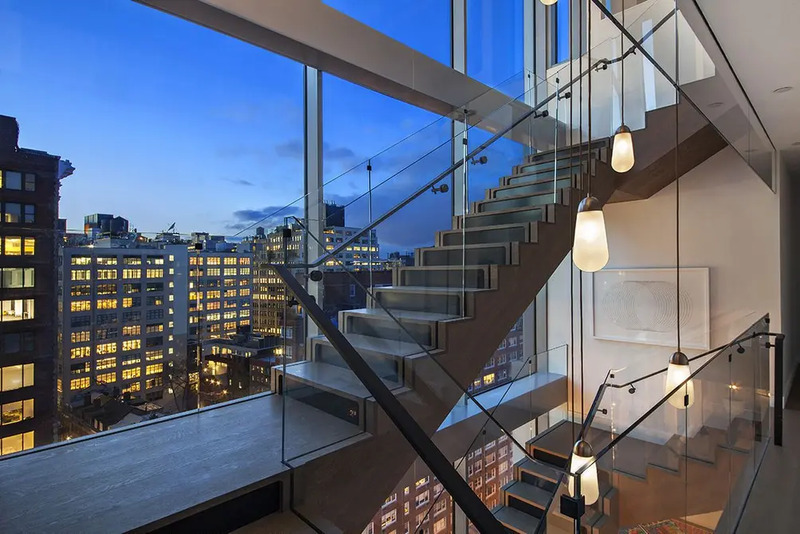 With its unparalleled views of downtown Manhattan, you enter this dynamic triplex by a massive, triple-height stair framed by an astonishing 30-foot-tall wall of glass. 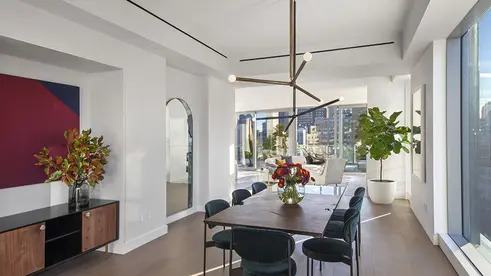 Throughout, the floors are made of 7 rift and quarter sawn custom stained White Oak, and off the entry gallery there’s a dining room and a living area with a window wall that leads to a 400 square feet terrace with views south to the Freedom Tower. In addition to a windowed pantry with a two-zone 103-bottle wine refrigerator and a secondary hallway entrance, there’s the eat-in windowed kitchen that features a 54 Gagganeau refrigerator, a steam oven, double dishwashers, hand-made bleached solid walnut cabinetry designed by Studio DB, Blue de Savoie marble, and a large center island, all of which may be closed off by sliding steel doors. The show-stopping PHA has a private elevator that serves all three levels, a great room, three wood-burning fireplaces and two entrances. There’s a bedroom on the first level and two more on the second, each with en-suites that look like magazine spreads, and include a honed St Germain marble custom slab sink and a Jacques Adnet Circulaire mirror. The master has a WBFL, an enormous windowed dressing room, and a bath with a large floor-to-ceiling window, a free-standing soaking tub, and a door that leads to another terrace, which in turn leads to the rooftop terrace or outdoor living room that’s reachable through stairs. A true oasis for the ultimate in relaxation, this landscaped area of over 1400 square feet includes an opulent sunken spa, an outdoor shower, another WBFL, a catering kitchen and a living area with sliding window walls. PHA, which is distinct in design and extraordinary in nature, bridges the gap between inside and outside and offers breathless soaring vistas that can be seen though almost every dramatic thermopane window, the kind of home that many envious luxury buyers are now looking for. Here, the finest touches, right down to the radiant-heated Dolomiti marble floors and the catering kitchen, make this listing, with sales being handled by Stribling, one of the finest and indulgent triplexes around. 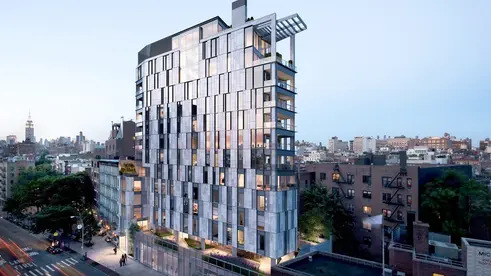 Building amenities for One Vandam include a 24/7 Concierge, full-time super and porter, private storage, fitness center, washer/dryer in building, and central AC throughout.